Our last stop in Oklahoma was not on our original list, but we kept hearing about the amazing garden and heritage seed program being run by the Cherokee Nation. Unfortunately Pat Gwin, director of the heritage seed project as well as the Cherokee Nation Natural Resources Department was out of town, but a few phone calls made by the Nation’s media director put us in touch with the Secretary of State Chuck Hoskin Jr, who was kind enough to meet us on a Saturday morning to tell us what he could about the program. The original homeland of the Cherokee extended throughout present day Georgia, North Carolina, South Carolina, and Tennessee. Despite the US Supreme Court upholding aspects of Cherokee sovereignty in a series of cases that has come to be known as the Marshall Trilogy (after Chief Justice John Marshall), President Andrew Jackson defied the court and ordered the removal of the Five Civilized Tribes (which included the Cherokee) to Indian Territory, present day Oklahoma. Many Cherokee were rounded up into prison camps and between 1838 and 1839 forced west during a series of trips, resulting in the death of an estimated 4,000 people from hunger, exposure, and disease. 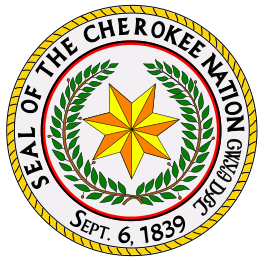 There are currently three federally recognized Cherokee tribes: the Eastern Band of Cherokee Indians in western North Carolina who resisted relocation, and in Oklahoma the Cherokee Nation of Oklahoma and the Keetoowah Band of Cherokee Indians. The Cherokee Nation of Oklahoma is headquartered in Tahlequah OK, and has a tribal jurisdictional area spanning 14 counties in the Northeast corner of of the state, including Adair, Cherokee, Craig, Delaware, Mayes, McIntosh, Muskogee, Nowata, Ottawa, Robers, Sequoyah, Tulsa, Wagoner and Washington Counties. 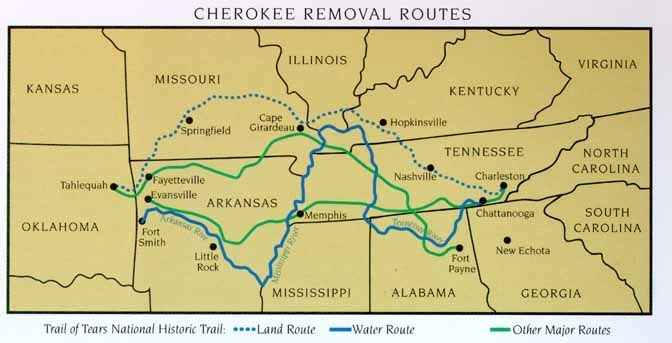 As with many tribes in Oklahoma, land in Cherokee territory is checkerboarded, with land owned by the Cherokee Nation and its citizen interspersed with non-Native land ownership. 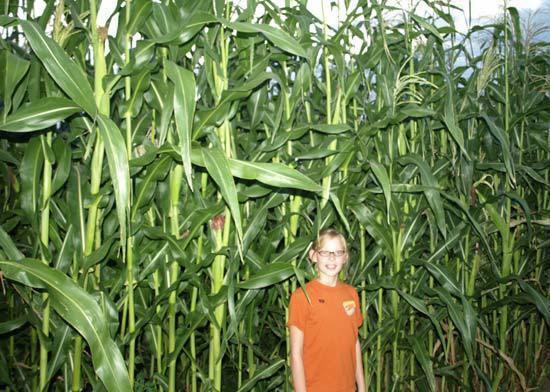 Caidlen Dunham of Jay, OK., stands in front of Cherokee flour corn planted from seeds distributed by the Cherokee Nation. Photo courtesy of the Cherokee Phoenix. The Cherokee have always been horticultural, growing corn, beans, squash and other produce, as well as tobacco and ornamental gourds. As Pat Gwin said quoting a Cherokee elder “No self respecting Cherokee would ever be without a corn patch.” But the number of farmers and gardeners in the Cherokee Nation has been dwindling. According to Chuck, “About 6 years ago our staff and some of the elders began talking about something we felt we lost, which was the connection to the plants our people used hundreds of years ago. We knew we still had them because families still used them. But we weren’t in any concerted way harvesting them, making the seeds available to our citizens.” Chuck credits Pat Gwin, Director of Natural Resources and Cherokee Nation Administration Liaison, for spearheading this effort, along with an elder named Crosslin Smith, who believed that one of his legacies was to make sure that the next generation would understand the plants that his parents and grandparents used in their gardens and told stories about. Collecting these heirloom seeds involved a lot of reaching out to different families who still grew some of these plants, having brought seeds with them on the Trail of Tears, as well as going back to members of the Eastern Band of Cherokee in the Southeastern US. They began a garden at the Cherokee Nation administrative building where these seeds were grown out, and in the past couple of years thousands of seed packets have been sent out to Cherokee Nation citizens around the country. To participate in the seed bank, gardeners are asked to provide a copy of a Cherokee Nation citizenship card, and proof of age if tobacco seeds will be requested. Only one variety of corn and gourds may be requested at a time, in an effort to prevent cross-pollination to keep the strains pure, and instructions are included with the seeds to teach gardeners about these issues. At the end of the season, these gardeners send seeds back to the seed bank, in order to provide for the following year’s distribution. The seeds are provided to as many citizens as possible, although the seeds with catchy names tend to get the most requests from gardeners, and run out first. For instance, Cherokee white eagle corn or Trail of Tears beans get more requests than turkey gizzard beans or dipper gourds. 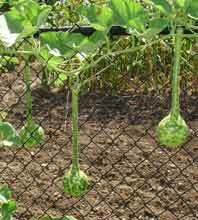 Cherokee dipper gourd. Photo courtesy of Cherokeeatlarge. 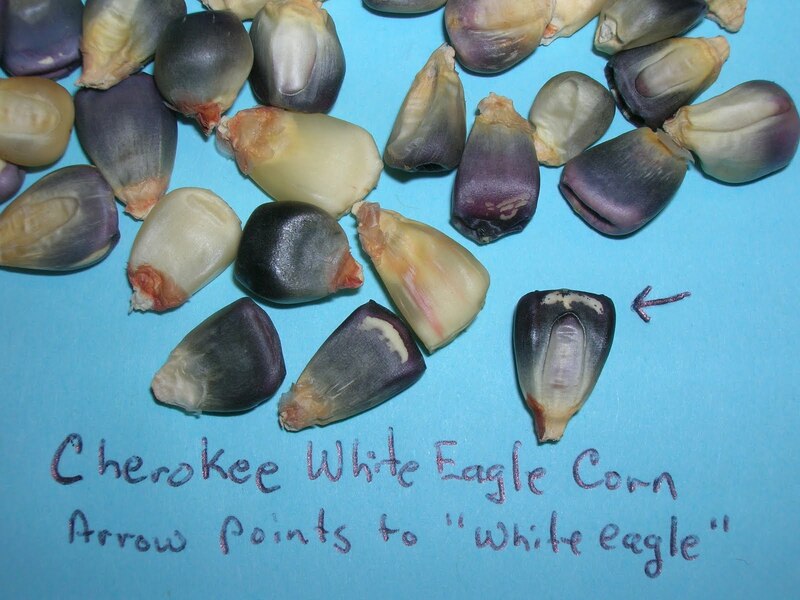 The goal of the heritage seed project is to help preserve these seeds, but also to encourage more Cherokees to garden and eat local produce, in order to improve their health. 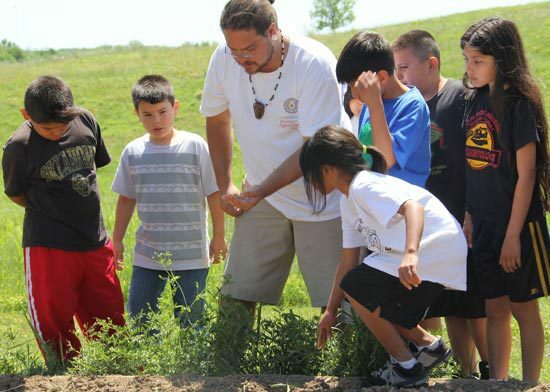 On this front, the Cherokee Nation has also been working with day care providers to establish gardens, and with local schools to source from Cherokee farmers. The Nation is currently working with small Cherokee-owned lamb producers and beef producers to source meat for Sequoyah High School. 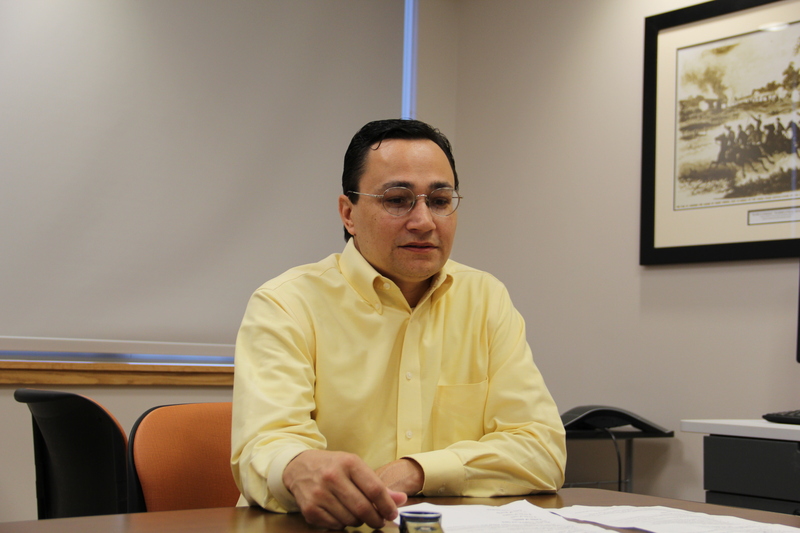 Chuck feels that it is important because “it encourages our people locally to do what they did historically, which is to produce food by Cherokees for Cherokees.” Cherokee Nation also contracts with day care providers, and has worked with these providers to establish the Learn to Grow garden project. On my way out of the health center, I had the opportunity to run into Lisa Evans, Cherokee Nation Child Care Resource and Referral, who described to me the success of these programs. 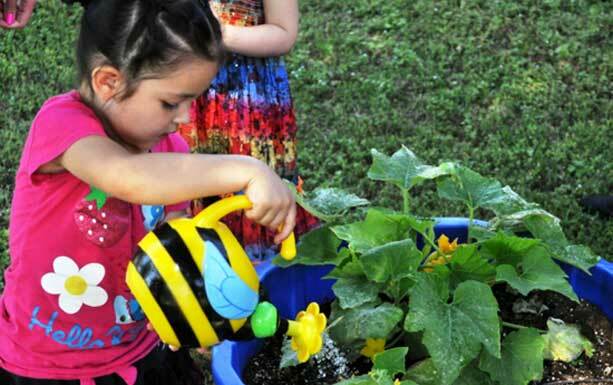 Last summer, the Learn to Grow garden project put 90 gardens in 78 childcare facilities (which includes family child care homes, centers, Head Starts and Cherokee Nation relative providers) across five counties in Northeast Oklahoma. This sumer that number has grown to 102 day care facilities. This project has reached nearly 3,000 children, and by extension 10,000 family members. The child care providers received a 6 hour training provided by Oklahoma Cooperative Extension, and then participated in follow-up sessions where they shared ideas, pictures, and experiences. 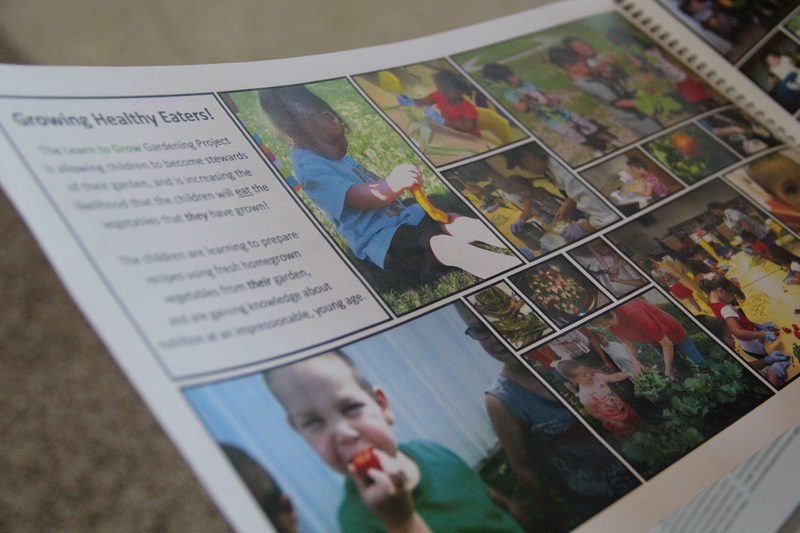 The aim of this project was to increase the likelihood that children will develop healthy eating habits, to teach them about plants, soil, and insects, and to encourage family involvement. A few of Lisa’s favorite success stories included a boy whose grandmother offered to buy him a toy at Wal-Mart, and he chose a watering can for the school garden instead. Another boy named Roper was so excited when the cucumbers finally ripened that he took his nap with one, and then took it home to share with his grandmother. Other stories included young children who convinced their families to start gardens at home because they enjoyed their day care gardens so much. 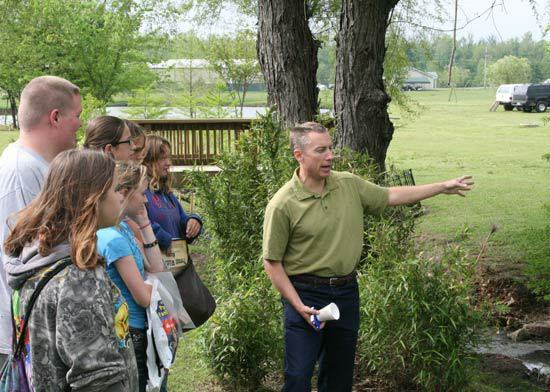 For more information about the seed bank, call Mark Dunham at 918-453-5336 or visit the Natural Resources webpage at www.cherokee.org. 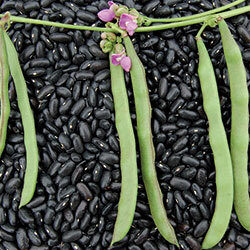 Seed requests can be emailed to pat-gwin@cherokee.org or mark-dunham@cherokee.org. Where can we get these seeds?